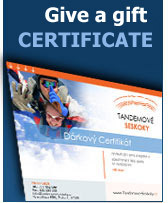 You can buy our tandem jumps via payment calendar as well. For information call our info line: 777 062 699. AFF courses can be also paid gradually during the course.